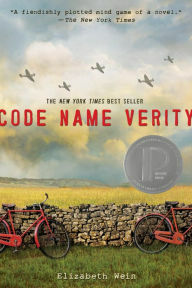 Elizabeth Wein's Code Name Verity was published in 2012, but it was only recently that I had even heard of it. Apparently, I must have been living under a rock: once I read about the book and perused the reviews that made it out to be the best thing since sliced bread, I thought I better get going on it. But while it was definitely well-written and creative, this was one of those novels that I just couldn't give a better than average rating. Many reviews say that they can't write much about this World War II novel since it would be giving too much away, so I'll go along with that. However, except for one twist (and even that isn't very surprising), the plot events are not that difficult to guess. Many lines give clues to the eagle-eyed reader about what they can expect later on in the story. Readers should also anticipate a lot of flight terminology that can be confusing after awhile. I think this is one of those books that I'll say "It's not you, it's me." I am definitely in the minority on Goodreads to give it an average rating, but I've read much better World War II books (Sarah's Key especially).